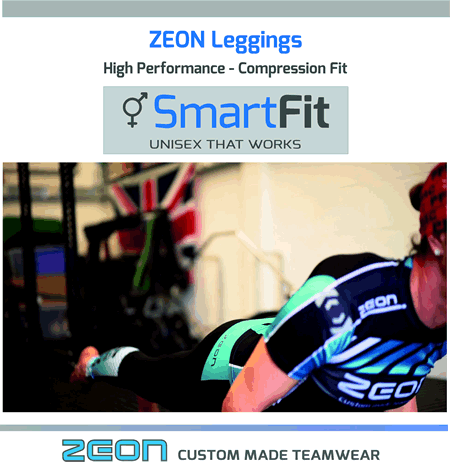 ZEON SmartFIT – Unisex fit that works. Available in Men, Women & Junior Sizes. Alison is a physio and palates instructor in her day job and running fanatic the rest of the time. She road tested the new Sublimate Print Zeon GYM athleisure leggings through a week at work, running and social. ‘These are bril for active use. The deep drop from waistband to crotch mean they don’t ride down even through a range of palates moves. The double layer in upper section helps a tight snug fit and, key, mean they’re not see through. Very comfortable performance fabric was great all through the day at work, and my friends where envious of the designs.’ These leggings are ideal for Running, Rowing and Multi Sport Cross Training. Zeon Ethical Manufacture: Our factory in China is fully Sedex Accredited. Sedex is a World Leading Organisation dedicated to driving improvements across ethical and responsible business practice in the global supply chain. [link to our blog]. Zeon Compression Fit Baselayers - custom made in your club colours.